Springfield Armory was the home of U.S. weapons design and the primary manufacturing site for small arms. Springfield Armory was founded in 1777 as "The Arsenal at Springfield" to manufacture and store weapons and ammunition for the Revolutionary War. Its site in south-western Massachusetts was chosen for its advantages in power, transport, and defense. It was on the Connecticut River, providing both transportation and power for manufacturing. It was also at the intersection of major roads. Meanwhile, it was far enough up the river to be safe from naval attack. The new government of the United States decided in 1794 that it should manufacture its own muskets and avoid dependence on foreign arms supplies. Two Federal Armories were selected by President George Washington — the Springfield Armory in Massachusetts and the Harpers Ferry Armory in Virginia (later divided with Harpers Ferry in West Virginia). Production at Springfield started with 220 flintlock muskets built in 1795. The Harpers Ferry Armory was destroyed during the Civil War, leaving the Springfield Armory as the federal government's only small arms manufacturing facility. A little over 843,000 Model 1903 rifles (commonly known as the 1903 Springfield) had been produced by the time of the U.S. entry into World War I. Springfield Armory built another 265,620 M1903s during the war. Meanwhile, Winchester took on a government contract to produce the M1917 Enfield Rifle, while the government's relatively new Rock Island Arsenal small arms manufacturing operation built another 47,251 rifles. 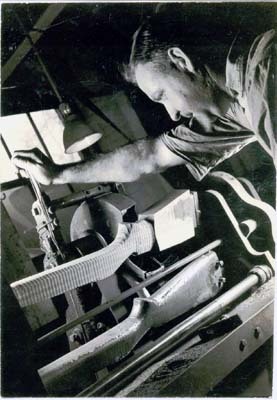 John Garand in the Springfield Armory shop. 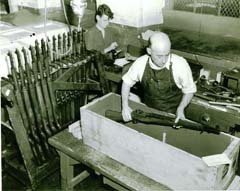 Rifle receivers were forged and then machined at Springfield Armory. The first step is to "sink a die", or to mill a die from hard tool steel. 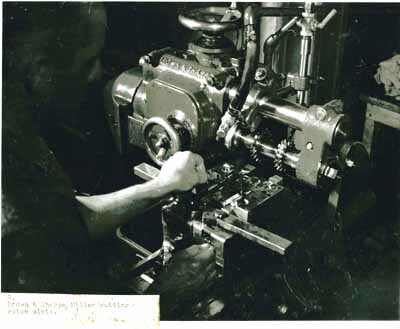 A receiver die being milled at Springfield Armory. A three-head mill cutting three dies at once. Dies have to be replaced frequently as the forging process quickly wears them down. Here you see the die itself. The die is the lower face of the forge into which a hot steel bar is hammered. 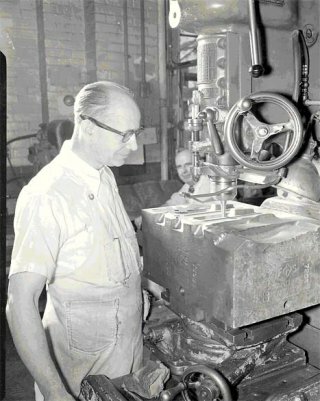 The series of pictures below shows the forging operation. A hot steel bar is placed into the forge, on the die and below the hammer. Repeated hammer blows then drive the hot steel into the die. The hot steel bar is being placed into the forge. The hot steel bar is being placed onto the die, below the hammer. Repeated blows of the hammer drive the hot steel into the die. Brown & Sharpe milling machine cutting guide slots in M1 receivers with two cutting wheels. 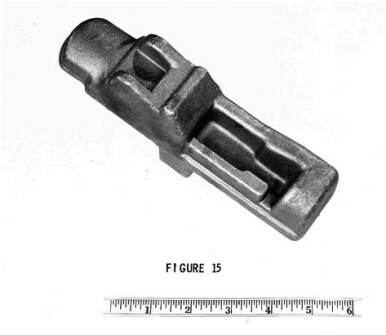 There is a discussion of the steel used to make some of the M1 Garand receivers in Hatcher's Notebook, Julian S Hatcher, Major General, U.S. Army, retired, The Telegraph Press, 1947. The specifications changed over time with experiences gained from armory testing and field use. 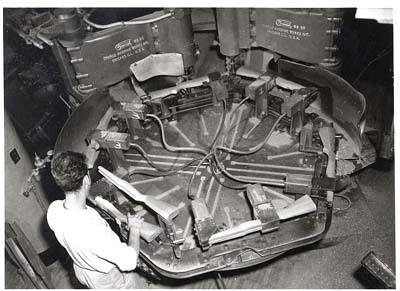 After July, 1942, receivers used WD Steel No. 8620 Modified, the same as for the bolt. The receivers were then heat treated. They were carburized 0.012" to 0.018" at 1600°F followed by an oil quench temper for one hour at 480°. The resulting hardness was Rockwell D 59 to D 67. 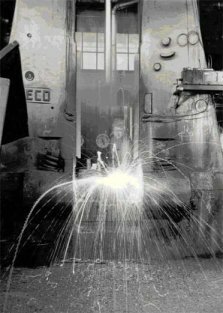 Once a forging had been hardened and passed testing, it would undergo initial machining. 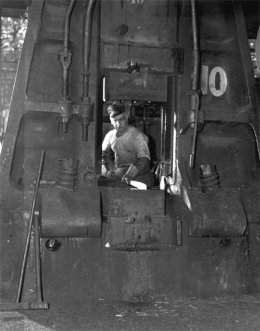 The first picture below shows a forging. The second shows a forging that has been through initial milling. Once a design process had been developed in a testing shop, it had to be industrialized for high output. The en-bloc clips were stamped from spring steel. 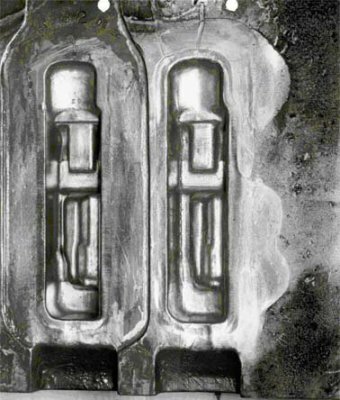 Multi-head milling machines were used to produce multiple parts simultaneously. 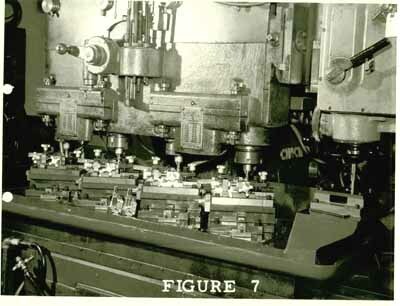 A 4-head gang milling machine simultaneously working on four receivers. 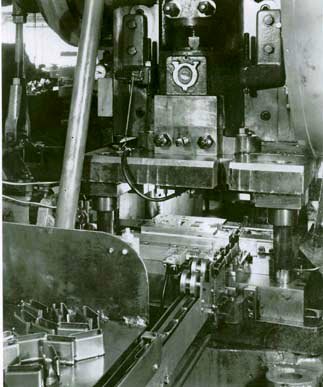 A stamping machine producing en-bloc clips. Woodworking was also an important part of the process. The preferred material was heart-grain American Black Walnut. The source had steadily moved west as the country developed. Local forests provided the raw material in the late 1700s. During the U.S. Civil War, it came from the mid-Atlantic states. By World War II, midwestern states provided most of the walnut. A machine has followed a model to roughly cut a stock. Further work will be required to smooth this and reach the final shape. A man named Thomas Blanchard worked at Springfield Armory for five years in the early 1800s. He was an inventor of mechanical devices, mostly for manufacturing purposes. His inventions were awarded over twenty-five patents. These started with his mechanical tack-maker, and included a carriage speed regulator and several machines for producing parts for ships. 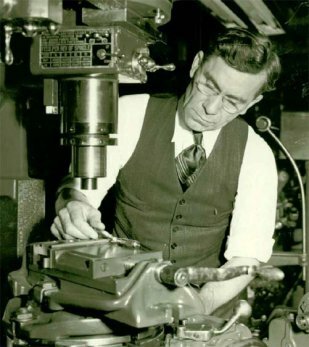 He also invented machines used for building guns, a barrel lathe and a machine often called a "Blanchard Lathe" used to copy arbitrary 3-D shapes. 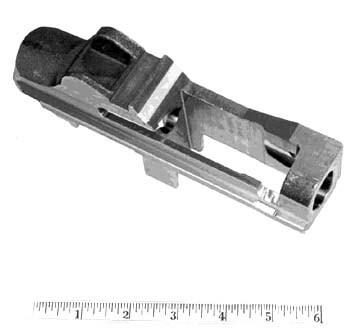 His initial design, patented in 1819, could quickly and accurately cut new gun stocks based on a 3-D model. It did not require a skilled woodworking operator. That's a 1930s Blanchard Lathe operating in the second picture below. Over 110 years since its invention, and still an excellent tool! 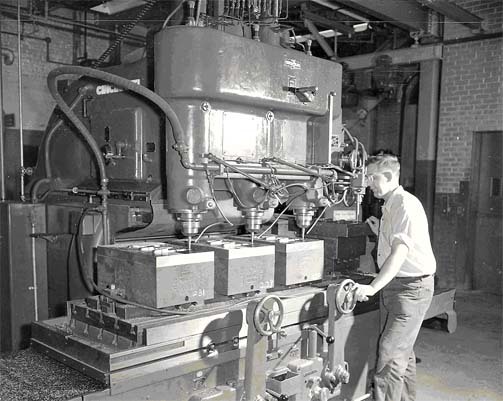 Newer Blanchard Lathes were developed to increase productivity. 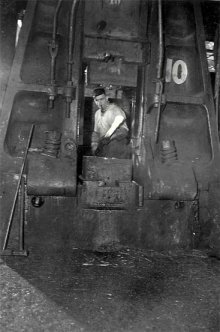 The unit shown above, in operation toward the end of World War II, cut and sanded three stocks simultaneously. 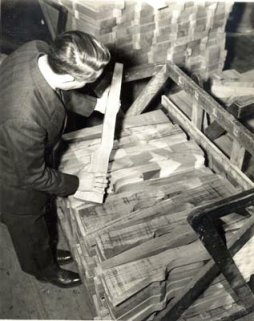 The exterior shape could be cut by a Blanchard Lathe (and in later models, smoothed and sanded), but precise interior voids had to be milled out to clear the barrel and action. The process of inletting was also automated. 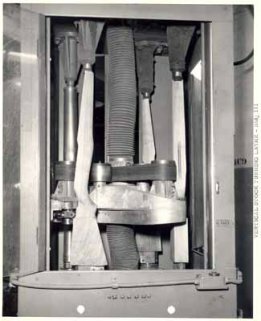 The system seen at right carried several stocks through a sequence of cutting operations, vacuuming the wood chips and dust as it worked. The rifles were assembled once all their parts were produced. 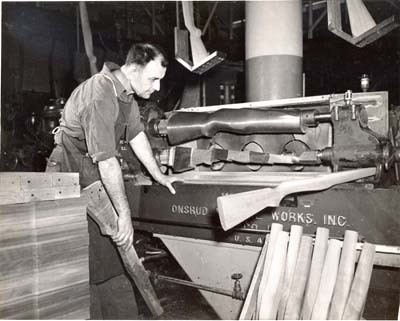 At left you see armory employees in 1942, packaging newly built M1 Garand rifles for shipment to American troops around the world. 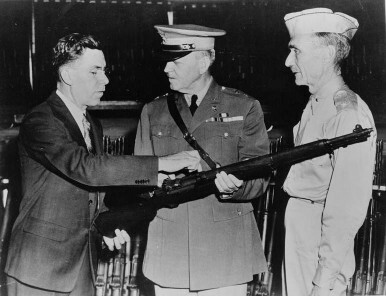 John Garand's T1E2 design, a modification of a design from 1926, was accepted and designated as the US Semiautomatic Rifle, M1 on 3 August 1933. It replaced the M1903 Springfield as the standard service rifle, although the M1903A4 remained in use until 1944 as a sniper weapon. 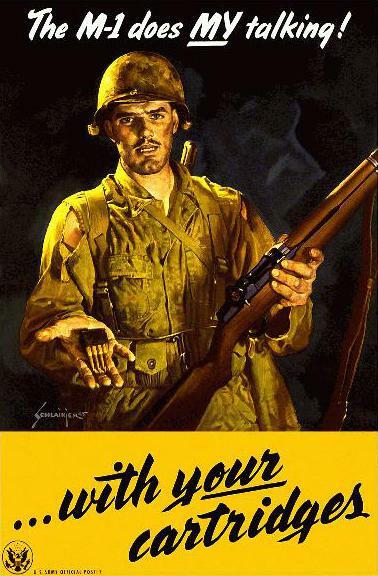 A little over four million M1 rifles were manufactured by the end of World War II, by Springfield Armory and by Harrington & Richardson and by International Harvester. There were a number of M1 variants, including the experimental bullpup design seen here. Most, however, never saw active duty. The exceptions were the sniper variants, the M1C and M1D (formerly M1E7 and M1E8, respectively). 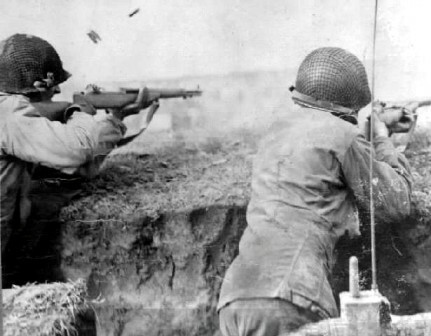 The M1C was adopted as the standard U.S. Army sniper rifle in June, 1944, replacing the M1903A4. Its design required drilling and tapping the hardened receiver to mount the telescopic sight. The M1D differed only in using a simpler mount. Either of them is simply an M1 with a mounted telescopic sight (M81, M82, or M84) mounted to the receiver and a cheek pad laced to the stock. 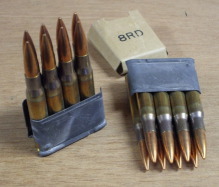 A flash hider was available as an accessory, either the conical M2 or the prong design T37. The M1C and M1D were standardized in 1944, but few M1D models were produced by the end of the war and neither saw wide service until the Korean War. 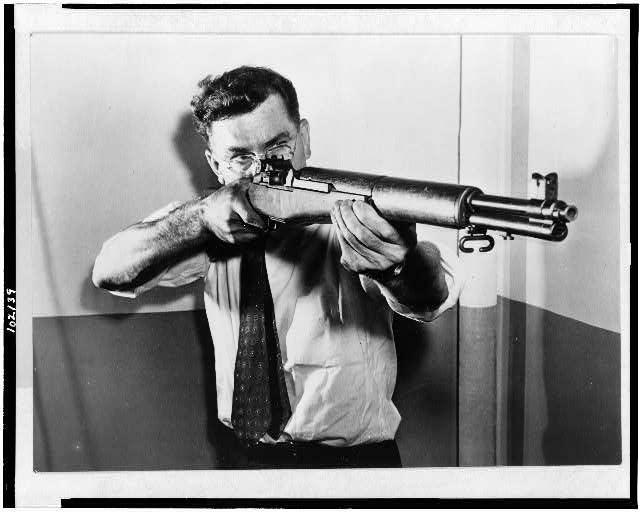 John Garand with an example of his design. 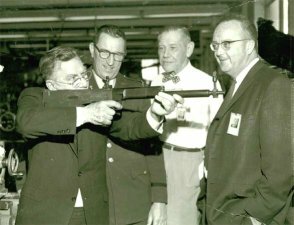 John Garand pointing out features of the M1 rifle to senior Army officials in 1944: visiting Major General Charles M. Wesson, at center, and Brigadier General Gilbert H. Stewart, commanding officer of Springfield Armory, at right. An M1 in action — the photograph catches the ejection of the last cartridge and the empty clip. The M1's semiautomatic operation provided a significant firepower advantage for U.S. forces. The soldiers of the Axis forces — German, Japanese, and Italian — usually were armed with bolt-action rifles. Japanese banzai charges against poorly-trained Chinese troops armed with bolt-action rifles had frequently been successful. Those charges generally failed against U.S. forces armed with the M1 and capable of sustained firepower. The obvious advantages of increased infantry small arms firepower led to increased development and deployment of semiautomatic and fully automatic small arms on both the Allied and Axis sides. General Douglas MacArthur wrote from Bataan that his forces' M1 rifles were "performing in an outstanding manner" and operated "without malfunctions under combat conditions as much as seven days consecutively without attention." General George Patton wrote in January, 1945, "In my opinion, the M1 Rifle is the greatest battle implement ever devised."